Choosing the right device for car battery recovery is not an easy task. On the modern market, there are plenty of powerful jump-starting machines for the engine that will save you in an emergency. 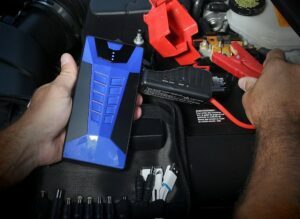 To make it easier for you to decide on a suitable charging device, I present an extended guide how to pick the best jump starter for the diesel engine. You can check out our review of the best jump starters in 2018, it includes common information about all type of all jump-starting machines (not only jump starters for diesel engine). I hope these articles help you make a good decision and satisfy your needs. 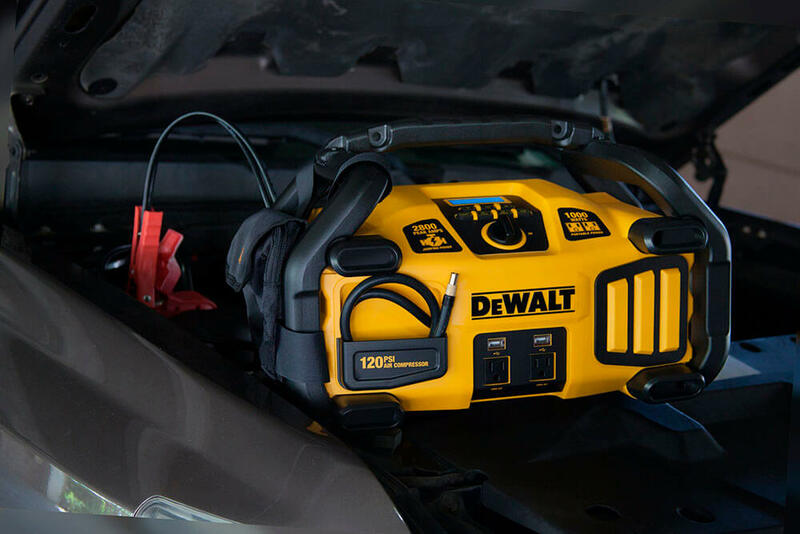 The first charging device that is competing to become the best jump starter for diesel is the DEWALT DXAEPS2 Professional Power Station. 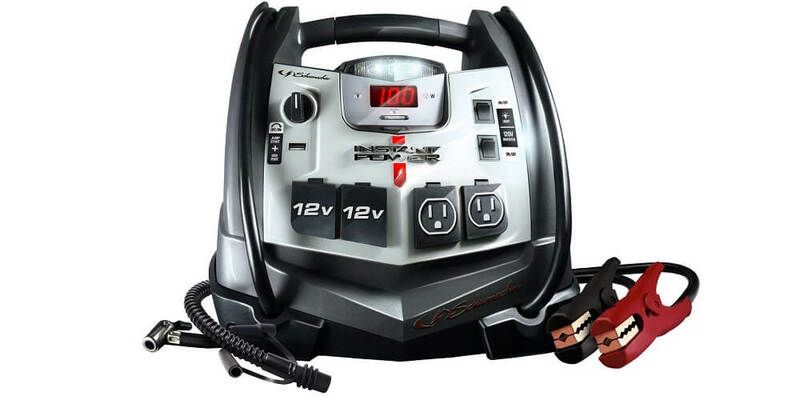 The DXAEPS2 is a multi-purpose power source, an effective air processor, and one of the best novelties among the up-to-date jump starters. Power of 1000 watt, 2800 Peak Amps and 120 PSI digital compressor aren’t those features making the DXAEPS2 the best jump box for diesels? 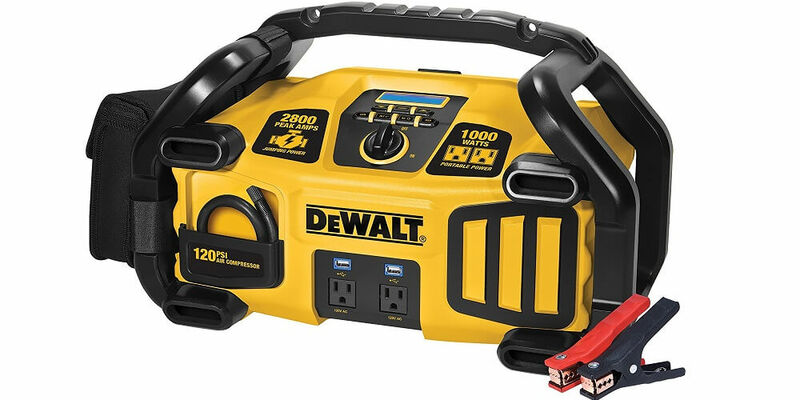 However, you shouldn’t rush to conclusions, I suggest looking through the main pros and cons of the DEWALT Professional Power Station presented below. The air compressor contains a 12-foot air hose, a screw cap, and a built-in pressure gauge. 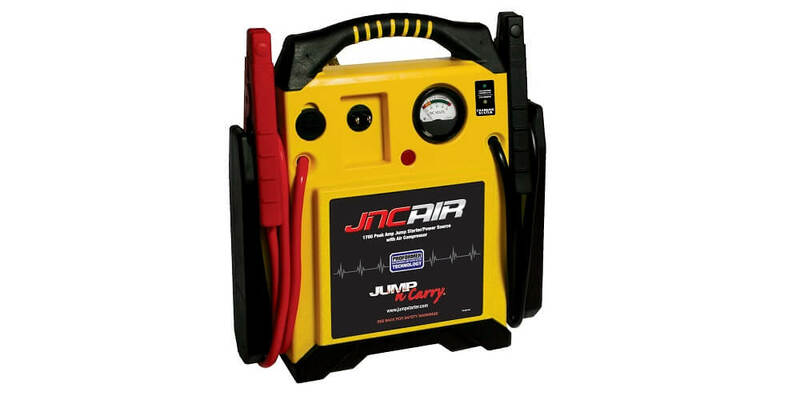 The second jump-start system, which may be considered as the best jump starter for a diesel engine is Jump-N-Carry JNCAIR 1700. 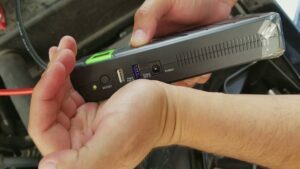 This particular device is designed with the latest technology and in such a way that you can jump-start any vehicle, from cars to huge trucks. In my immodest opinion, the developers skillfully placed all the important functions in the Jump-N-Carry JNCAIR 1700, making it very powerful and beneficial. How can I prove this? 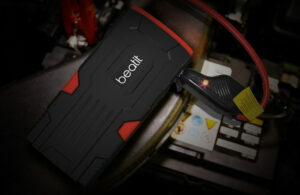 Below, an analysis of the main advantages and disadvantages of this jump starter is presented. Incomparable power (Clore PROFORMER battery technology) 1700 Peak Amps, 425 Cranking Amps. Has a built-in AC adapter providing automatic and quick charging Includes an efficient. Air Delivery System a 12 ft. air hose and a screw-on chuck Premium 68” jumper cables and industrial grade. Hot Jaw clamps Contains a voltmeter that informs the charging status of an onboard battery. Charges other accessories with a 12 Volt DC Outlet. Lacks an on/off switch unlikely to other jump starters. May not hold a full charge. 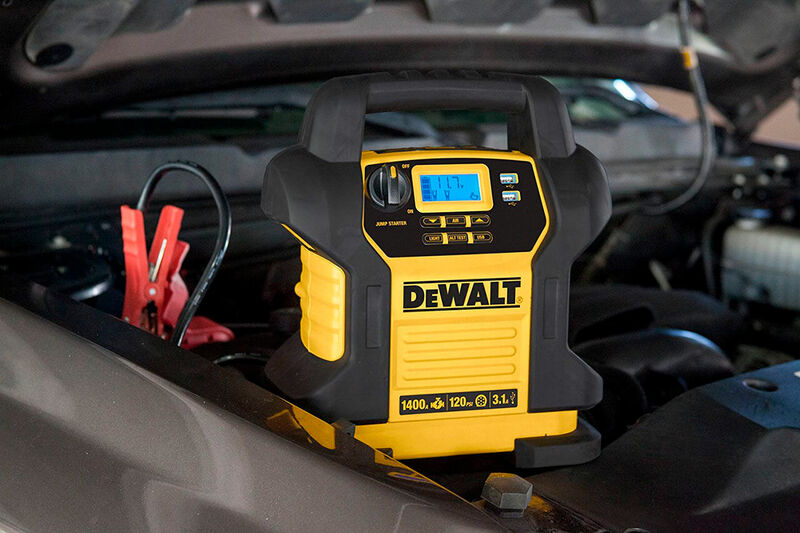 The DEWALT DXAEJ14 Jump Starter is an innovative device providing considerable recharging to large V6 vehicles. 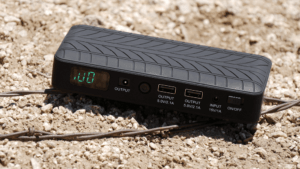 The reason why this model deserves to be called the best jump starter for diesel trucks is a decent mix of reliable features, for example, 1400 peak amps and 700 instant amps, or digital 120PSI air compressor with auto stop. 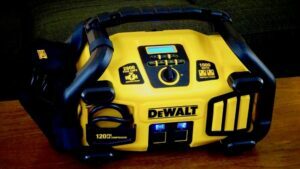 The DEWALT DXAEJ14 is an affordable power source that copes with the tasks quickly and easily, without leaving the user indifferent. A “Surefit” nozzle Equipped with an Alternator Check function. The LCD display to provide current charging information. 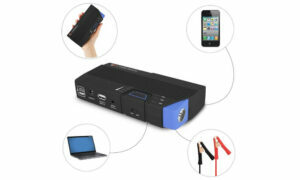 Dual 3.1 Amp USB outlets to charge small electronic devices. Clamps with high-strength metal powder coating. LED work lights on the back may not work properly. 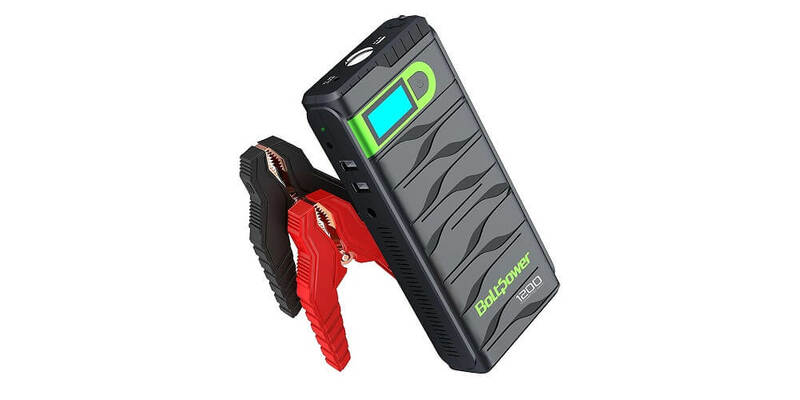 Bolt Power N02 Beast Jump Starter is a portable appliance delivering power to cars, RVs, SUBs, motorcycles, tractors, trucks, trailers, and many other vehicles. I call this the best jump starter for diesel due to its high-quality and powerful jumper clamps that can start both gas and diesel engines. Furthermore, Bolt Power N02 1200 is a small and light battery jumper so there won’t be any problem for you to fit it in your pocket. Sounds fantastic, isn’t it? When buying Bolt Power N02 Beast, you’re are offered important safety features that will protect your electronic equipment in cases of overload, overcharge or short circuit. 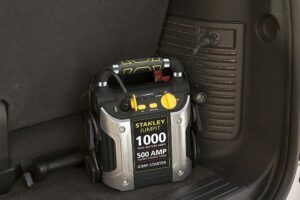 However, how about the pros and cons of specific car jump starter? 600 cold cranking amps, 1200 peak current amps. Heavy-duty jumper clamps with an integrated circuit protection. Digital display to control the charge level. Built-in flashlight with different modes. 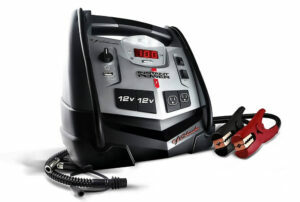 Here we come to the last jump starter in our list Schumacher XP2260 Instant Portable Power Source. I’m totally sure that this power station can’t be left without attention since it deals with plenty of different tasks and comes at a reasonable price. Schumacher is the best jump box for diesels, a tire, and air mattress inflator, and an effective power station. In an emergency situation on the road or when you want to charge your smartphone quickly, Schumacher XP2260 makes it best to satisfy your needs. 1200 peak and 185 cold cranks amps. 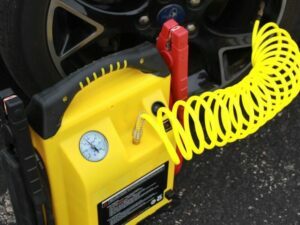 Ensures tailgating, tire inflating, boating, camping, etc. Built-in 150 PSI air compressor. 4 various modes of output. On/off switch to activate Jump Starter. 2 USB ports to charge small devices. A sealed lead acid battery. Digital display to monitor the battery status. Needs a storage bag for cables. 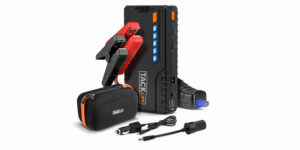 In this part of the article, I want to provide you with more detailed information on portable jump starters, which are increasingly gaining popularity. We tested several models and collected a lot of useful information about these devices. Below, I will answer to the most popular questions about car jump starters. Now that you’ve got acquainted with the popular jump-starters, I believe it’s time to dig a little deeper and learn the basic information about the jump starters and their use. 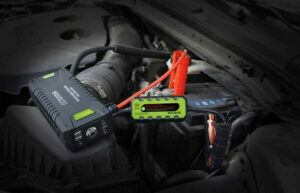 A jump starter is a tool designed to bring back to life the dead battery of any vehicle. This smart power device is simple and convenient, which makes it an irreplaceable assistant in case of emergency. 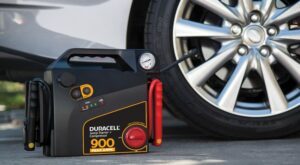 An updated and the best jump starter for diesel engine should also be multifunction so that you may not only jump-start a car but also pump up a tire or charge a tablet. How Do the Jump Starters for Diesel Work? 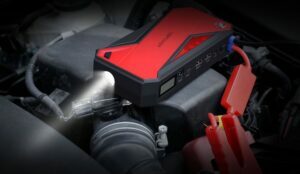 Before you opt for the best jump box for diesels, it’s necessary to discover how the diesel jump starter actually works. Firstly, this device has a battery, portable cables, air processor, and often USB ports. Secondly, a pair of these portable cables is responsible for jump-starting the battery of your car. They can charge small and big cars, trailers, motorcycles, tractors, and even trucks if you need. These cables have clamps which one has to connect the battery to the power source. The battery starts charging immediately after a proper connection. What else is interesting about the work of the best jump starter for diesel trucks? Well, these cables do not generate sparks, as usually occurs to standard cables. All because these devices have a special battery made of lithium-ion with a high level of discharge. 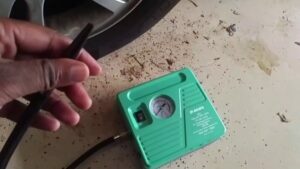 How to Jump Start a Diesel? 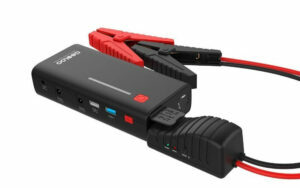 A jump starter for diesel is a versatile and useful charger for your iron horse. Its most important advantages are portability and compactness, without which you may find it difficult to withstand an emergency. Imagine you are driving home late at night and your car suddenly stops showing signs of life. A professional driver would advise to wait for another driver and ask for help or call a tow truck. All this can take much time, so think about buying a handheld jump starter to avoid inconvenience. So, what are the basic principles of the best jump box for diesels? First, these devices work right after launching and do not take much time. 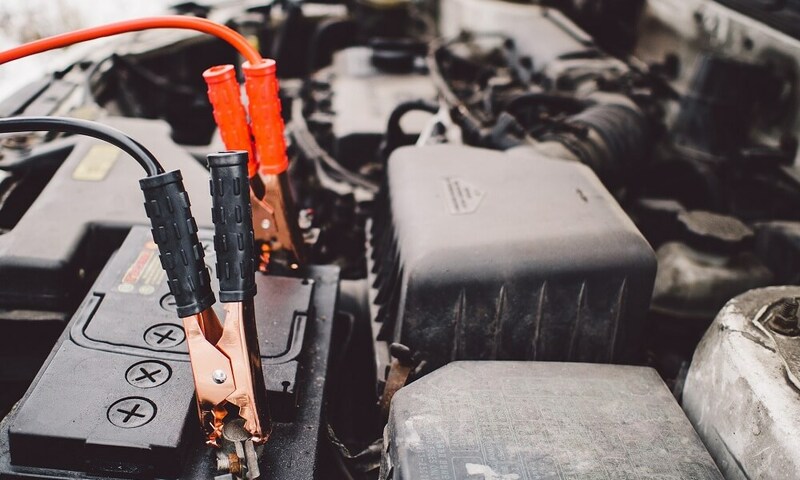 When you see your car battery dying, pull out a diesel jump starter from the trunk, connect the appropriate cables and jump-start your car on your own. Secondly, jump starters in 2018 have a lot of energy. If you look carefully at the models on the top, you might have noticed that all of them have huge power. To resurrect the battery of your car, it’s enough to start the jump starter once and its maximum power will cope with the task quickly. Thirdly, jump starters are equipped with various functions and are very easy to use. Except for the simplicity of jumpstarting a diesel engine with such devices, they include plenty of useful features. These are USB ports for charging a phone or any small electronic device, an automatic charger, a digital cable for storing cables, and many other things. Many new jump starters are suitable for both diesel and gas engine. For example, when a jump starter has a peak power output of 800 amps, it can start a five-liter diesel engine or six-liter gas engine. The difference between the two types of engines, in this case, is that for diesel it will take more energy. Even the weakest jump starter can start a gas engine, but it might be difficult to cope with a larger diesel engine. 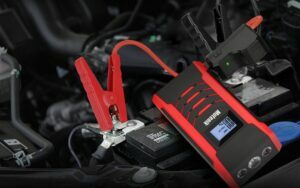 Therefore, when choosing a jump starter, examine its characteristics and find out whether it is suitable for your car. One of the frequently asked questions among car owners is what are the cranking or peak amps and their main purpose. Well, let’s figure it out together. The first, namely the peak amplifiers, determine the highest current that is able to jump-start a diesel in a matter of seconds. Such a high-current impact is powerful, but it quickly disappears and if you still can’t launch your engine, the cranking current enters into force in the form of cranking amps. If you fail to start your car at first, do not worry, the best jump starter for trucks will not leave you in trouble. What is the cranking current? Well, it is what you need to pay attention to when selecting the powerful and best jump starter. Often, the peak current is not enough, no matter how hard one tries. Therefore, try for a more extended crank and wait some more seconds (no more than 5 seconds) and jump-start your vehicle. Every decent jump starter comes with built-in safety features. Yes, since here we play with electricity, we need security and accuracy. In fact, no one guarantees that your car starter will work without interference for 10 years. On the other side, it’s wrong to think these devices are dangerous because usually the developers put much effort to make the most convenient car appliance. And so that the buyer did not have doubts about buying a diesel starter jumper, the companies took care of typical safety functions, which I will discuss below in detail. The first and most important safety function is a short-circuit protection. A short circuit is a frequent process that can destroy the starter and its contents. A short circuit occurs when the jump leads touch and subsequently cause a high current passing from the positive to the negative terminal. 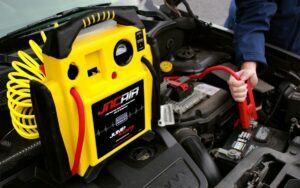 This function should be included in every jump starter, so before buying, find out from the consultant all the details about it. The overcurrent protection prevents the jump starter to supply more current than the fixed limit. Thus, the device will be protected from any damage. The third security function, intended only for the device, is overload protection. It prevents the starter from getting an excessive amount of current when charging. In the event of a failure or overvoltage from the network, the jump starter will stay safe and sound. Another significant safety function of any jump starter is an over-voltage protection. It allows the starter to avoid getting more voltage than indicated in the product description. It can also be useful in case of network overvoltage. 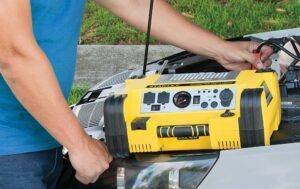 Overcharge protection is important because it provides a full and efficient charging of the battery of the jump starter. That is, when the batteries of the car starter have already been charged, the actual charging of the device will not be automatically terminated. 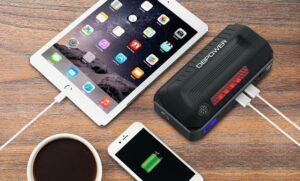 Thanks to the protection against overcharging, at the moment when the batteries are full, it “floats” charge the jump starter, and the voltage will never increase and destroy the device. All these and other basic safety functions were created in order to get rid of all possible risks in working with the jump starter. It really impresses how carefully the developers treat their customers and produce multifunctional and safe jump starters for diesel. There’s one more question left, namely, what is the guarantee of a modern jump box. 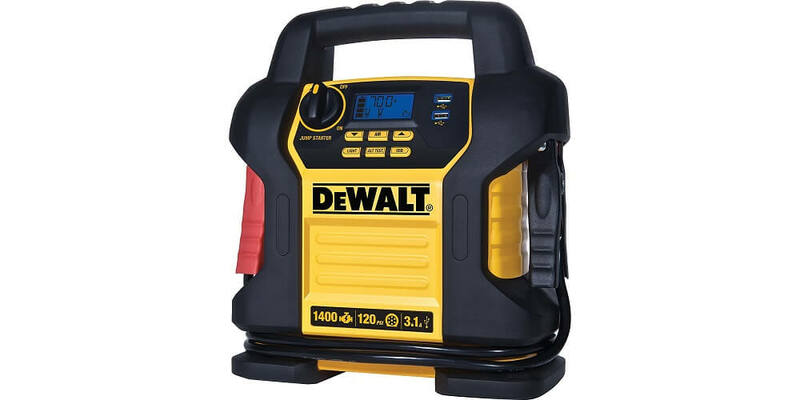 In most cases, a portable starter receives a one-year warranty, which is already encouraging. If you are offered a shorter period, be careful and consider your purchase. There is a wide variety of powerful and effective jump starters, all produced to the highest standards. However, choosing the best jump starter for a diesel engine can be quite challenging and time-consuming. I hope this article will be helpful and you will be satisfied with your purchase in the future.